There are lots of books available to help Christian marriages. But there are fewer resources for Christian singles. And even fewer that are truly biblical. This short article by Marshall Segal is among the best I've ever found. If you are single, or care about someone who is, read it! I don't know much about Bill Whittle, but his refutation of gun control ideology is succinct, comprehensive, and compelling. While America darkens spiritually, the sacrifices of Hudson Taylor's generation of missionaries and the suffering of Chinese Christians under Mao have made China one of the most spiritually open nations in the world today. My mother recently received this letter from a college student in China. (Can you imagine anyone her age in the US writing a letter like this?) Grammar has not been corrected. I want to detailed introduce myself to you, because I hope that we can become good friends. I was born in 1993, my Chinese name is _____. My English name is _____. And now I study English and HOLY BIBLE in a school. But my English is bad, ____ told me about you taught English Bible before. She said, you love China so much, you pray for China all the time. So I want you to help me to study English and THE BIBLE. But I am very sorry that I cannot listen to your English Bible class. Because our English teacher told me that we have English corner now. So I cannot listen to your class. I hope that you can forgive me. When I talk with you, I feel that you are a godly Christian. So I hope that we can pray for each other in Jesus Christ. And I want to write a short passage send to you every weekend. So I also hope that you can correct my essays, if I have some wrong sentences. But I do not know that will you agree to help me? I hope that you can help me. Do you want to know my testimony? I want to tell you about my simple testimony. When I was a little girl, I went to the church with my grandmother. She was a Christian, but now she was in heaven with Father. When I went to the church, I just to played. I do not know God at that time. My grandmother always preached The Gospel to me. She always told me that God loves me all the time, I need God in my life, sometimes I fee God is with me, but sometimes I do not know where is God? Because my faith would doubted at that time. I know there is one God in the world. But I am not sure that Jesus is my savior. Because I cannot see Him, this was my thought before. After that, I was in middle school, our teachers told us, there is no God in this world, gradually, I believed this lie. When I left my school, I did not been to church, but after that, I had some trouble in my life. I do not know how to spent these difficult days. At this time, I felt God is with me and comforted me. And same time, I remembered that my grandmother said, God never abandoned me. So I return to before God. I known that I was a sinful person, I need Him , Father gave His only son who His name is Jesus, Jesus died on the cross for me ,and His blood clean my sin. He gave me a new life in Him, and gave me an everlasting home, that is beautiful heaven. He is there now. I was baptized in 2008. I know I am a baby in Jesus, Sometimes I will sin, I also know God will sad for me, I hope that The Holy Spirit lead me live a holy life and He can give me wisdom and understanding to know God’s words more and more, I pray to Father, He can help me obey Him command and enjoy Him in my life. And I also pray to God is always with me, and leads me to fellow Him forever. This is my simple testimony. In my family, only me believe in Jesus, because I grew up in my grandmother home. So hope that my family can believe in God, I hope that you can pray for my family to believe in Jesus. My goal is become a translator in the future, so this is why I will study English, because I want to translation for some missionaries to China to preach The Gospel. This is my thought now. My English grammar is terrible, I ask you to correct me. OK. I hope that you can through my testimony know me. I also hope you can pray for my study English. Do you have anything need me to pray for you? If you have, you can share with me. God bless you and your family more and more! My pastor has been preaching through the book of Job. One obvious lesson from Job's friends is how easy it is to give bad "encouragement" to people who are suffering. 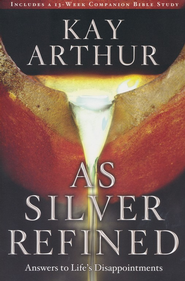 Kay Arthur's book As Silver Refined is an example of the opposite of Job's friends. It's filled with Scriptures, true stories, and warm encouragement for people who are in a season of suffering. My only complaint is that the book meanders. Joni Tada's When God Weeps is a highly organized, Biblical answer to the problem of suffering that could be used as the basis for a college class. But As Silver Refined is more like a sit-down conversation with a good friend over a cup of tea. The topics repeat in slightly different ways throughout the book. Part of this may be because As Silver Refined was originally a series of messages Kay gave on her radio program. And actually, this repetitiveness is probably just what a sufferer needs. When we're hurting, we don't primarily need concise answers; we need repeated, caring, truthful encouragement from Scripture. And that is what Kay Arthur delivers in this book. If you know a woman who is going through a trial, this book would make a great gift. You can download chapter 1 for free here. Disclaimer: I got this book for free from Waterbrook Multnomah in exchange for writing a review. My review was not required to be positive. Thankfully I found a free program (written by a German!) that has been working wonderfully for me. Easy to install and easy to train, Spamihilator uses multiple detection techniques to catch spam before it hits your inbox, making it highly accurate from the very first. I highly recommend it. A word of encouragement to young people. If you can learn a foreign language now while you're young, you will have a tool with which you can bless people for the rest of your life. Being bilingual is an incredibly handy skill in today's world, just like knowing how to drive, type, ride a bike, or swim. You can use a second language both to make money and to make disciples. When you get old like me you won't have nearly as many spare minutes or spare brain cells. I wish I had spent more time learning languages when I was a teen and less time playing chess, reading fiction, and studying calculus. Judging by the title you might expect this to be a 'me-centered' song, a song to use in twisting God's arm to give you health, wisdom, and success. But dig in and you'll see that it's celebrating His gifts of love, mercy, refuge, and eternal rest. It came from the heart of a woman who was bed-ridden for years and wrote these lyrics in a hospital bed.